The most wanted Chechen rebel warlord, Shamil Basayev, has died in an explosion in the neighbouring republic of Ingushetia. Russia's FSB security service chief, Nikolai Patrushev, said Basayev was killed in a "special operation". But a pro-rebel website said Basayev and three other militants died when a lorry carrying explosives blew up accidentally. Basayev, a key Chechen rebel commander, led many major attacks against Russia. President Vladimir Putin said his death was "deserved retribution" for rebel attacks, including the deaths of more than 300 during a school siege. The September 2004 attack on a school in Beslan, in the North Caucasus, led to at least 331 deaths. It triggered outrage in Russia and other countries, as many women and children were among the victims. The pro-rebel Kavkaz-Center website, citing a member of the rebel parliament, said Basayev had died "a martyr" in the lorry explosion on Monday near the village of Yekazhevo in Ingushetia. US President George W Bush's reaction to Basayev's death was: "If he's in fact the person who ordered the killing of children in Beslan, he deserved it." The BBC's Damian Grammaticas in Moscow says Basayev has been top of Russia's most-wanted list for a long time. Mr Patrushev was shown on Russian television briefing President Putin on the killing of Basayev. The FSB chief said he was among a group of militants killed as they prepared to carry out a "terrorist act" in Ingushetia, which borders on Chechnya. "This was made possible because of our operations abroad, primarily in countries where weapons were obtained and then sent on to Russia, where the terrorism was carried out," he told Mr Putin. The Russian president said "this is the revenge the bandits deserve for our children in Beslan, for Budyonnovsk, for all the acts of terrorism they have committed in Moscow and in other regions of the Russian Federation, including Ingushetia and the Chechen Republic". He announced awards for the Russian special forces involved. Earlier on Monday, Russian media reported that a lorry packed with explosives had blown up during a "special operation" against militants. Four militants were reported killed in the incident. Ingush Deputy Prime Minister Bashir Aushev, responsible for security, said experts had identified Basayev from the body parts. "All his distinguishing features were found," Interfax news agency quoted him as saying. He said there were no casualties among Russian security forces, but two civilians were injured in the operation. Akhmed Zakayev, a Chechen rebel envoy in Britain, said the killing of Basayev "will in no way" change the situation in Chechnya. "As long as a mutually-acceptable relationship has not been established between Russia and Chechnya, there cannot be a lasting peace," Mr Zakayev told Russia's Ekho Moskvy radio station. Russia had previously offered a reward of $10m (£6m) for the capture of Basayev. He claimed responsibility for masterminding the Beslan raid, but blamed the children's deaths on Russian forces, who stormed the school to end the siege. Basayev led the first mass hostage-taking by Chechen rebels - in the southern Russian town of Budyonnovsk in 1995. He also claimed to have organised the assault on a Moscow theatre in 2002, during which 129 people died. He was a key commander of the resistance after Russian forces invaded Chechnya at the end of 1994. When Russia was forced to withdraw its forces after the first Chechen war ended in 1996, Basayev stood for president, but came second to Aslan Maskhadov - the more moderate separatist leader killed by Russian troops in March 2005. 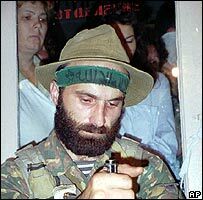 Basayev also served briefly as prime minister in the self-proclaimed independent Chechen republic of Ichkeria in 1997.